My name is Paul M Umbaugh III. I would like to start off by telling you a little about myself. I was born and raised as a catholic. I was told that I was "baptized" into the gates of heaven as a baby. I had always been told that if you were a good person and did the best that you could, that when you died, you would go to heaven. However, this did not seem right to me. After meeting someone and continually attending a Baptist church, I began to hear our Lords word in a new light. I was encouraged to read the word and participate in discussions. I began to truely understand lifes purpose and our Lords will. I personally accepted the Lord Jesus into my heart on Dec 1, 2002. I immediately felt the desire to share our Lord with others. Acting as a mere "messenger" for our Lord, I was able to share our Lord (as personal Lord and Savior) with family members, co-workers, neighbors, friends and others. At least 200 lost souls came to personally know the Lord at this time. Through the Lord, I started a couple of nursing home ministries where at least another 100 lost souls came to know our Lord (several were to die shortly thereafter). Several friends were having me talk to other family members of theirs, what a blessing. I continued very strong in the faith. I helped to start a home church in 2004, which is ever so strong in the Lords will. Then on June 3, 2005, my whole life was about to change and the miracles our Lord still performs today were about to be proven for many. Most of all I am about to tell you came from family members, ex-family members, friends and hospital records and notes, as I can not remember any of it. I was in need of a total knee replacement (TKR), which I was suppose to have done on my left (L) knee on June 15, 2005. Because of overusing my right (R) knee to protect my (L) knee, I had been having a hard time walking around. I ended up with a cyst in the back portion of my (R) knee which began to hurt pretty bad. I went to the local E.R. and was admitted in the very early hours of June 3, 2005. I started having a seizure and then stopped breathing. A "code blue" was called @ 1140 hrs. A doctor and nurses performed CPR at that time and brought me back to life. I was transferred to the E.R. to have a STAT CT scan performed. The CT scan revealed that I had brain edema, subarachnoid hemorrhage @ basilar cistern, transtentorial herniation, mucosal thickening @ the (L) ethmoid sinus. I coded again at 1325 hrs and was put on life support. My family was all contacted and advised that I was on life support and they should start saying their goodbyes. They were advised that I was brain dead, and the only thing keeping me alive was the life support machines. My family knew that I did not want to be kept alive by machines and the hospital staff was getting them to sign to take me off of life support. My one daughter refused to sign the paperwork and the good Lord said - hold on - its not time yet - and I began to breathe on my own. At this time it was decided that I should be transferred to another hospital. The doctor who did my surgery talked to my then wife and ex-wife and advised that if they did not transfer me or do anything, that I would surely die, that I would possibly die anyway, but I at least had a chance if they transferred me. I was flown via bayflight to Morton Plant Hospital on June 5, 2005. A CT scan performed at MPH showed subdural blood along (R) tentorium with subarachnoid blood along the high (L) temporal lobe and blood in the ventricular system bilaterally without hydrocephalus. Low attenuation (R) cerebellum, focal infarct suspected. An angiogram confirmed the CT scan. The neurosurgeon advised that the only thing to do would be to take out the (R) PICA, that it would be a 14 hour surgery, and I probably would not survive it. The doctor had not only never did a surgery like this one before, he had never seen one that bad and where it was located. The aneurysm was centered on the brain stem, effecting both sides. The doctor advised that this was a mycotic aneurysm (caused by the knee surgery infection) and they would have to try and let it calm down before attempting any surgery. The doctor again advised that I probably would not make it, but if I did, I would most likely never be able to walk again, or be blind, or severely disabled. The doctors I worked for at the time did not like the odds and began searching the internet for the best neurosurgeon they could find. On June 6, 2005, I went into respiratory failure at 0420 hrs. and was brought back by our Lord one more time. I also had an MI and went into renal failure at 1400 hrs, but, again, I'm still here. The doctors I worked for found Dr. Harry Van Loveren who was described as the best neurosurgeon in the world. He was at Tampa General Hospital. Dr. Van Loveren had performed surgeries like mine before and agreed to see me. I was flown via bayflight again to TGH on June 7, 2005. I was admitted into the ICU. Dr. Van Loveren was on his way to Washington D.C., to conduct a seminar on brain stem research with President Bush and congress. The doctor wanted to wait for surgery for the infection to calm down. On June 16, 2005, I had a (R) suboccipital craniotomy, C1 laminectomy, clipping of PICA aneurysm, occipital to PICA artery bypass graft, microsurgical dissection technique and the skull was replaced with titanium instrumentation. The bypass did not work, but by the grace of God, the surrounding veins picked up the slack and I am here today able to share this testimony with you. During the course of my hospital stay I developed a UTI, clots in both arms, high blood pressure upon standing as well as everything else mentioned. 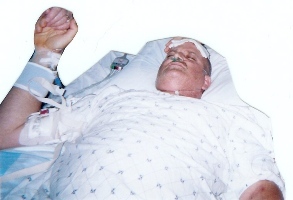 I made a promise to our Lord that if he let me out of the hospital, I would share this testimony with as many people as I possibly could and show of the miracles that our Lord still performs today, and that he and he alone is still in charge on the throne. Several have compared me to the apostle Paul, Lazarus and Job, but I have to say, that I am just an ordinary person, trusting in our Lord Jesus, and hoping to be a servant by following his example and sharing his love for the world and telling others how they too can share in his love. Our Lords love is available to everyone by accepting his free gift of eternal life through salvation. I was D/C from the hospital on July 21, 2005. I still can't remember going to any of the hospitals. I only remember a very little bit about waking up at TGH a couple of weeks after the brain surgery. I don't remember seeing family, friends or others at the hospitals even though I have seen pictures. I have problems remembering people later on after I meet them, and remembering things I do during the day, later on in the day, even though I can remember things from long ago. It seems to be a short-term memory loss problem. I do not know what the last thing I remember from before the knee surgery is. I remember seeing the nasty scar on my (R) leg and knee, and the nasty scars on my head after I got out of the hospital. It is such a strange thing not knowing how they got there. I still have a lot of problems with my balance, I stumble a lot and feel dizzy a lot, especially if I have to look to the sides or behind me. Both of my feet from the ankles to my toes are numb as well as my right pinky and ring finger and the whole right side of my head. But, as I have said before, by the grace of our Lord, I am here and able to share his word with all who will listen to it. Since being released from the hospital, I have been able to share the gospel with at least 200 lost souls thus far. I have shared the testimony at several churches and have seen several come to know our Lord. I started two additional nursing home ministries through the Lord and witnessed 13 at one and 11 at the other come to know our Lord personally. I kept these going until my wife at the time left me 3-months after I got out of the hospital, as I was not able to go back to work. Satan was trying, but will never take my faith away. The doctors I worked for before all this happened did not want me to come back to work for safety reasons and advised for me to file for disability. I am still waiting for disability at this time. I have not, nor will not, stop serving the Lord or sharing his word. Since my wife left, I have passed out in excess of 5,000 tracts, shared the gospel with at least 200 others, who have come to know our Lord and I will continue to share his word. I attempted to go to work in PA, doing the same type of work I was doing before all this happened. I did it for 3-weeks, but kept stumbling into walls, had a very difficult time walking because of my knees, and had a problem remembering people. But I was able to do it for that time and I found out the reason why. I shared the gospel with at least 40 people in Philly and passed out 25 tracts at the Philly airport, and another 50 tracts around Philly. So the Lord made it possible for me to get paid while I was there. My daughter and her boyfriend came and brought me back to Florida. I want to continue to share our Lords word any way that I can and would like to write out and say this salvation prayer with anyone and everyone who is not 100% sure that when they die they will go to heaven, so that you can be 100% sure as the Lords word says. Please repeat this prayer after me and share it with as many family members, friends, co-workers and neighbors as you can: Dear Lord Jesus, Heavenly Father, I admit that I am a sinner and wish to repent of my sins and ask for your forgiveness. Thank-you for dying upon the cross and shedding your blood and rising again the third day in fullfillment of the scriptures to take away the sins of the world to all those who believe in you. I trust in you and ask you to come into my heart and count on you and you alone to take me to heaven. In your precious name I pray -- AMEN. I thank you for this opportunity and may God Bless you. On August 20, 2006, I went to Northbay Hosptial in New Port Richey in reference to a bad headache that continued steady for a week along with bad left shoulder pain radiating into the left hand with numbness and tingling as well as pain in my right flank. I went into the ER and they gave me a nitro tablet, I "flat lined" "coded" for just over 15 seconds (once again, the Lord pervailed). They took me for a CT scan and found that I had a massive pulmonary embolism in my right lung. I was taken to the ICU and had SX the next morning to put a filter in my pulmonary artery. After waking up from the procedure, the doctor who did the procedure and his assistant talked to me in the recovery room and explained that they had never seen an embolism that massive before and wondered how I could have even been breathing. They said that the embolism had to have been there for about a year with the size of it. I explained to them what happened with the aneurysm and they said that was how I had to have gotten the embolism also. I shared my testimony and the Lord with both of them right then and there in the recovery room with several others listening in. I just wanted to update to show that the Lord is continuing to use me to share His word and the miracles that He performs. I have been continuing to share our Lord with others since I first wrote my testimony and have (all through our Lord) been able to lead at least another 150 souls to our Lord. I love Him so very much and will continue to share His word with as many as I can until the day that He decides to bring me home. Thanks again and God bless!!! !